Scotland may have a turbulent past, but there is something undecidedly romantic about a country that has fought for its freedom for hundreds of years; did you know Glasgow is reputedly the final resting place of St Valentine? It is also the setting for many popular historical novels such as Sir Walter Scott’s Waverley and Diana Gabaldon’s Outlander. So now that we’ve settled Scotland is an incredibly enigmatic and romantic country, here are 8 of the most romantic places in Scotland you need to take your best friend or significant other. One of Scotland’s most beautiful love stories is set in the 11th century involving King Malcolm III (b. 1031, d. 1093) and Queen Margaret (b. 1046, d. 1093). Royals rarely married for love during this time, but for political, social and economical reasons. Malcolm III is said to have fallen in love with Margaret upon meeting her. He proposed, but she declined as she wanted to be a nun. Rather than force her hand, her pursued her for 2 years until she said yes and they were married at Dunfermline Abbey. Their marriage was a happy and loving one, and it is said the illiterate Malcolm would stare at and kiss Margaret’s most prized books. Upon hearing Malcolm and their eldest son had both fallen in battle, Margaret died from grief two days later. They were buried at Dunfermline Abbey, where they were wed.
Sweetheart Abbey is another abbey associated with a loving marriage. The abbey was named Dulce Cor (‘Sweet Heart’ in Latin) in memory of Lady Dervorgilla, who founded the abbey to pay tribute to her deceased husband, John Balliol. When Lord John died in 1268, his grieving widow had his embalmed heart placed in an ivory casket and is said to have carried it with her everywhere. When she died in 1289, Dervorgilla was laid to rest in front of the abbey church’s high altar, holding her husband’s heart to her chest. The Birks of Aberfeldy is a popular and easy walk, and was the setting for Robert Burns’ famous poem of the same name. Admire the colourful birch, oak, ash and elm trees, the Falls of Moness and several other waterfalls that inspired this Scottish bard to pen some of his most famous words. Rannoch Moor is one of the last remaining wildernesses in Europe. Loch Ossian is located a short walk from one of the most remote train stations in Scotland- Corrour Station. For friends and couples looking for remote romance on a budget, the Loch Ossian Youth Hostel is a fantastic property located right on the loch. Imagine pouring a wee dram and cosying up by the fire to loch views after a day hiking the munros in the area. Also, there isn’t any Wi-Fi once you pass the small bed and breakfast next to the station, so you can spend uninterupted time with your loved one. The Isle of Skye is truly magical. I spent an incredible two days here with a girlfriend during November, and the highlight of our trip was the stunning views of the otherworldly Quiraing. Try hiking the Quiraing for sunrise, and watch as the first light illuminates the colourful heather and hills. Arthur’s Seat offers a stunning panorama of Edinburgh- and makes for a romantic hike in the centre of the capital city. Scenes from the romantic flick One Day, based on the book by David Nicolls, were also filmed here. What can be more romantic than star-gazing in Scotland? Galloway Forest Dark Sky Park is just one of four ‘Dark Sky Parks’ in the western world and the largest forest park in Scotland. Stargazers here have the opportunity to spot shooting stars, the rare Andromeda Galaxy, the Aurora Borealis and stellar nurseries, where stars are born! 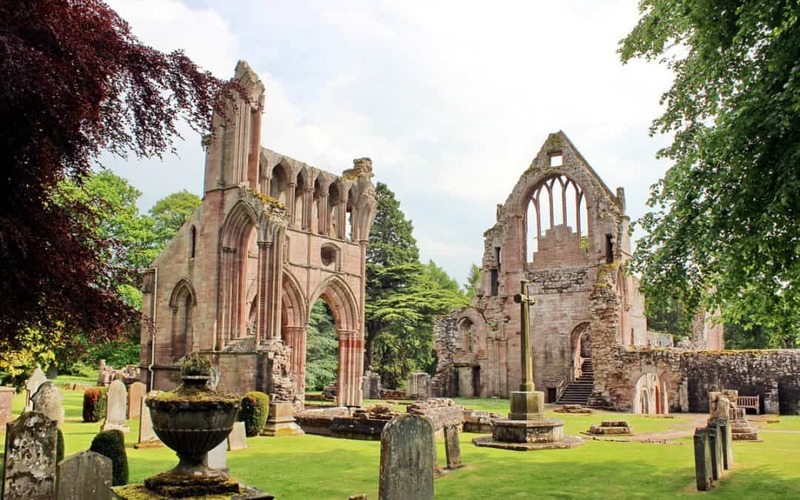 Dryburgh Abbey is where the historical writer, Sir Walter Scott, is buried. Sir Walter Scott was a primary figure in Romantic movement in Scotland and England during the late eighteenth and the early nineteenth centuries. Sir Walter is attributed for being one of the reasons the Dress Act of 1746 (which saw the wearing of Tartan, Kilts and Highland wear outlawed in Scotland) was repealed. His Waverley novels swayed the nation, portraying Highland Scots in a different light: brave and loyal everyday people who fought for their freedom. It was also Sir Walter who advised King George VI to purchase a Highland outfit for his visit to Scotland in 1822. This helped the kilt to be reintegrated back into Scotland’s national identity. Sir Walter Scott chose Dryburgh Abbey as his final resting place- a fitting place for a romantic soul. Do you know any other romantic places in Scotland? Comment below!